When we looked at the Piledriver CPU, we ran it with our standard CPU review HD 6970. However, our CPU review game and 3D benchmark suite is a bit long in the tooth. In an effort to keep our readers more well-informed, we went back to the drawing board to run our much more modern gaming suite (which we use in all GPU reviews) on a more modern, powerful GPU – the ASUS HD 7970 DirectCU II TOP to be precise. This is a good thing for you, our faithful readers, because you get to see more relavent performance and, more importantly, it allows us the opportunity to update the suite and GPU for future CPU reviews! In addition to the head-to-head, we also check out how the recent improvements to AMD’s Catalyst driver played out on a Piledriver system. Our head-to-head competition pits each company’s top of the line against each other. Astute readers will point out that the motherboard is a big thing leading to the price difference. You don’t have to have the top of the line MVE for an Intel system. That is true, no question. You also don’t need a CVF for an AMD system. If you take all other variables out of the equation, the processors are exactly $100 apart, so the FX-8350 itself is 31.3% cheaper than the 3770K. Moving straight on to the benching, we check out the synthetic part of our GPU testing, 3DMark03, 3DMark Vantage, 3DMark 11 & HWBot Heaven (Xtreme). The first two are more CPU bound than the latter two, so 03 & Vantage rest pretty squarely in the 3770K’s corner. 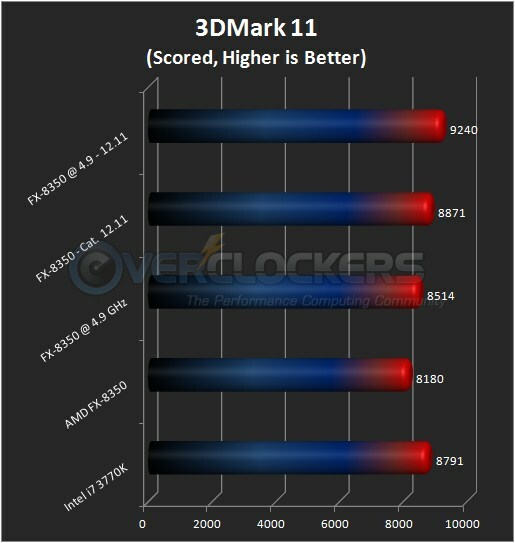 However, when you get to 3DMark 11, things are looking much better, with the overclocked FX-8350 closing in on the 3770K. When you use the latest Catalyst, it even jumps ahead of the 3770K with the older driver version. That same story repeats with HWBot Heaven. So, the FX-8350 can be close to directly competitive when benchmarking more GPU-bound benches. It’s not as strong as the 3770K, but that’s pretty obvious and it’s not marketed (or priced) to be as strong. Now we get to the gaming suite. You can see all settings in our video card testing procedure article, but long story short: everything is run at 1080P with all eye candy maxed out. Looking at the first three games in our suite, things aren’t looking too bad at all. Aliens vs. Predator is the best looking of the bunch, with the FX-8350 coming in just one FPS short of the 3770K. 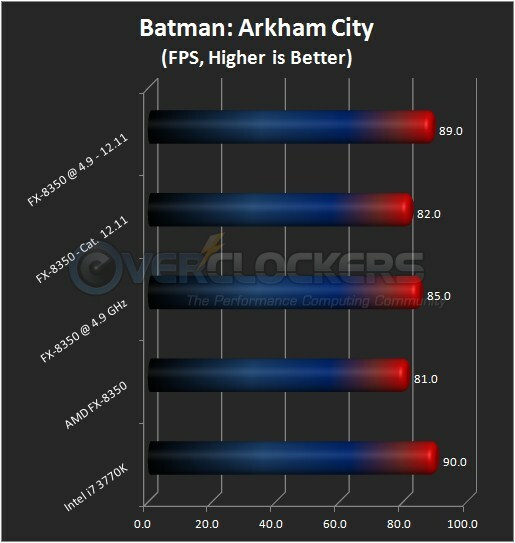 The FX-8350 takes a little hit in Batman, with a 9 FPS loss, but overclocking it regains some of that to cut the deficit to only 5 FPS. 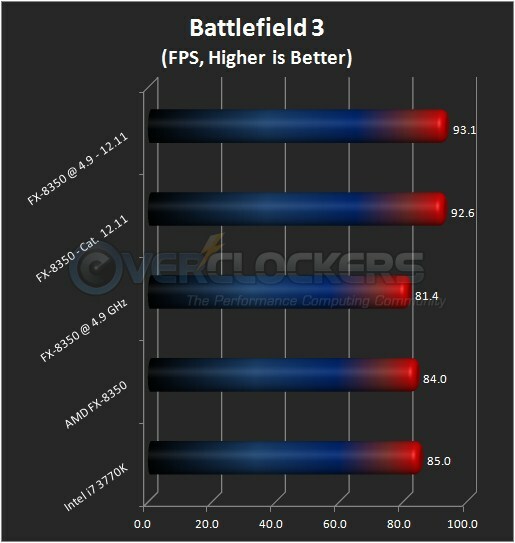 Battlefield 3 is very close at stock. The FPS actually lost a little bit overclocked. I’m not quite sure why it did that, but I ran the test a few times and came up with nearly identical results. In any case, a close race in these games. Civilization V is CPU bound. If ever there was any doubt, this proves it. Personally, I would disregard the overclocked Catalyst 12.11 result. I have no clue why it came out the way it did, but I ran the test three times with results within one FPS of each other. 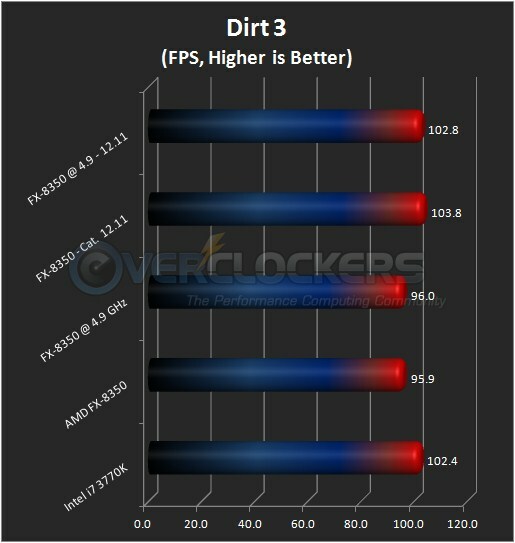 In any case, the 3770K comes out well ahead in Civ V.
Dirt 3 is another game where the FX-8350 is very-close-to-as-good-as the 3770K. It’s not quite as strong, but close enough that the driver improvements make up for the difference. Metro is always very GPU bound, so there is a very slim difference between the two tests here. Much like other GPU-intensive benchmarks, the two CPUs are very close and a driver improvement can make up the difference. Please note that obviously the 3770K would see similar improvements with the Catalyst 12.11 driver; we’re certainly not trying to hide that, we just haven’t had time to do the testing. 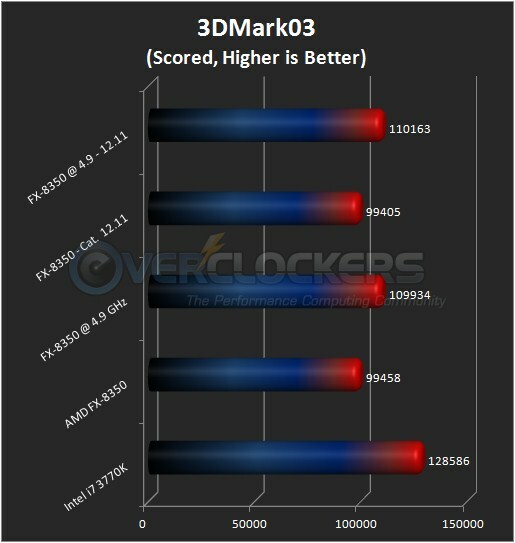 Now we’ll look at how the FX-8350 looks when compared relatively to the 3770K. 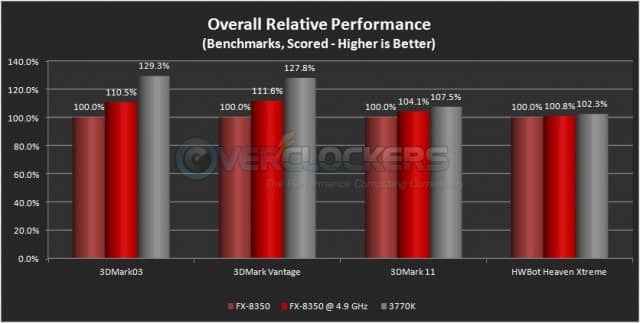 In these graphs, the FX-8350 always equals 100%. So, if the FX-8350 gets 10 FPS and the 3770K gets 11 FPS, the 3770K’s relative performance would be 110%, or 10% better than the FX-8350. Clear as mud? Good. I’ll graph these for ease of reading. 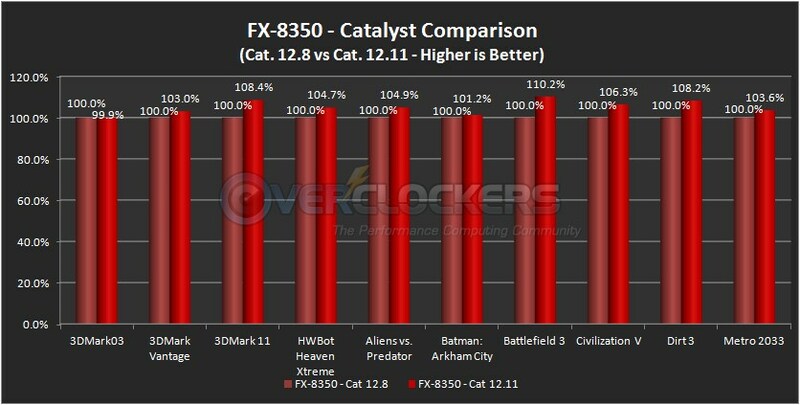 As the FX-8350 didn’t out-perform the 3770K in any scenario, the easiest way to describe the numbers in the chart is that the FX-8350’s performance is X percentage worse than the 3770K. Games are going to show one big anomaly – Civilization V, so we’ll show two scenarios again. With and without Civ V.
Taking Civilization V out of there really narrows the gap significantly, that’s for sure. Lastly, we have a bonus graph showing how much of a difference the driver improvement made when used on a Vishera system. Not much more to say about that! With one small 0.1% exception (3DMark03), everything increased with the new driver. The overall average increase ended up being 5.0%. AMD said Battlefield 3 would show the best increase when these were released and indeed they were right, with FPS improving an impressive 10.2%. So, what have we learned? Objectively, when looking at our entire benchmarking and gaming suite, the FX-8350 is priced right where it should be. Let’s start with a reminder of price. As configured, the two systems here are $220 apart, or 16.7%. As mentioned, taking all other variables out, the processors are exactly $100 apart, so the FX-8350 is 31.3% cheaper than the 3770K. 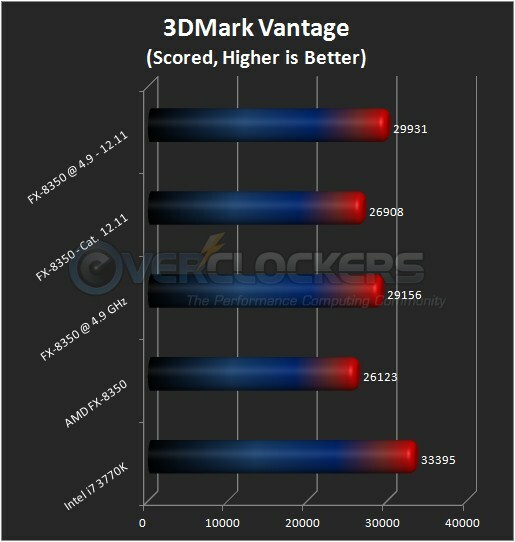 Getting the bad news out of the way, the FX-8350 does not out-perform the 3770K. Stock or overclocked, it cannot get scores or FPS above the 4.0 GHz 3770K’s level, period. 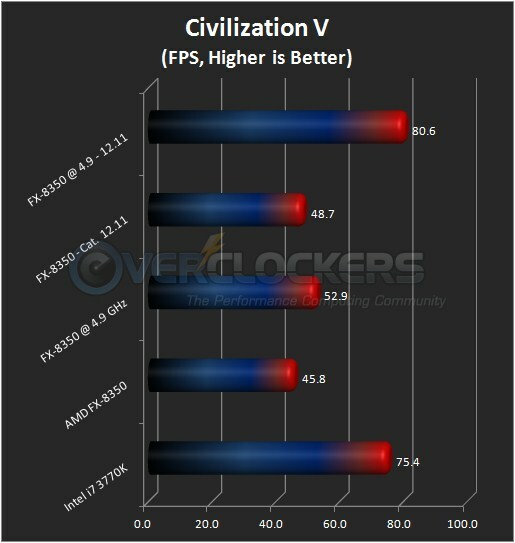 On the whole, including older benchmarks and Civilization V, the average difference between the two processors at stock is 15.4% (overclocked is reduced to only 10.1%). Both stock and overclocked, the FX-8350 does well, keeping its performance over the price difference. When you take out the old benchmarks (03 & Vantage) and the anomalous game (Civilization V), the picture improves dramatically for the FX-8350. In that scenario, the FX-8350’s deficit drops to an average of only 4.4% at stock (2.6% overclocked). When you look through those semi-rose-tinted glasses, the FX-8350 is actually quite the value. What muddies the water here is the 3570K, which is the same price as the FX-8350. I didn’t have one to test for this article and the one I just received is going into a project that literally can’t even fit the massive 7970 DirectCU II. I can tell you that the 3570K loses out on the productivity side (assuming integer calculations) thanks to the FX-8350’s eight integer cores. Taking that into consideration and the fact that the 3570K wouldn’t fare quite as well as the 3770K in the 3D department, I’d wager the two would be a pretty equal proposition. Wrapping up, if you play DirectX 11 games that are not Civilization V, an FX-8350 system could be a good buy. Taking all the numbers out and parsing all of this data down to one paragraph isn’t too hard either: The FX-8350 will never be as good as the i7 3770K, but it’s not supposed to be. It isn’t priced at the same level, coming in significantly cheaper. Instead, it’s priced right where it should be, with performance to match. 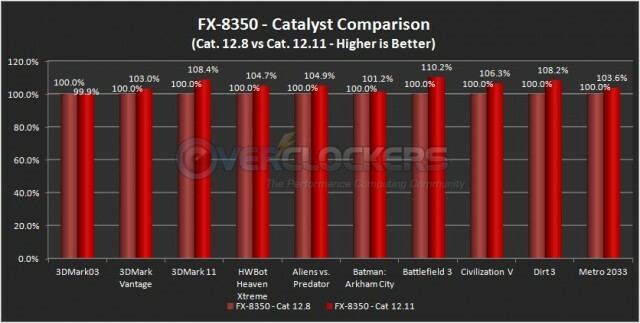 If you’re looking to save some cash, the FX-8350 will serve you well. A good overview though I'd feel it would be more thorough if it pointed out the big issue that fuels the often misguided AMD v. Intel arguments. Performance in games that are CPU bound via poor development. I'm speaking of games such as World of Tanks, X3 and Planetside 2 to name a few. Games where the raw single core power of processors such as the 3570 and 3770 result in AMD processors looking terrible. I'm not sure about Civilization 5 because I don't play it, but perhaps it's a good example of this as well. Put more simply. AMD is using 8 cores to cumulatively do, and sometimes slightly better, than what Intel is doing with 4 cores. You guys use some fairly well made games for your benchmarking but what about the hoard of games where the AMD processors show their true weakness? Those games can open up near 50% performance gaps between 8350's and 3570's. Agreed Hicksimus multi core chips have been out far too long for game developers to not be fully utilizing all cores available. But that's the world as it is most don't utilize more than 2 cores let alone 8. The amd chip is holding in there better than I thought it would. 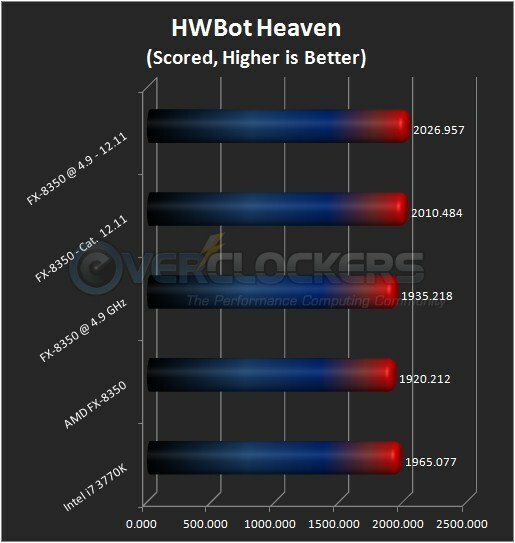 But the performance per clock is still behind the intel curve by a fair margin. Considering most 3770ks can hit at least 4.5ghz typically stopping in the 4.7-4.8 range things could get even more lopsided in a head to head. Am I the only one seeing the typos in the images? 3770K clocks are mentioned in the table up top and at least once in the article. I dont see typos... what are you seeing specifically? 3770K clocks are listed in the chart listing the systems and in the conclusion (it's 4.0 GHz, the results were pulled from the 7970 DirectCUII review). It was only run at one speed. What typos? I'll need some time (like not today) but I could go through and fix them. I see like 4 different 8350 graphs and a single 3770k one...don't quite get it. Great article, I think this will be helpful for a lot of people. This shows how over powered/under utilized most HW is. The 3770k is clearly the better cpu but in day to day/real world use the is barely any gains. There is one 3770K result, run at 4.0 GHz. There are four FX-8350 results. The two immediately above the 3770K are stock & overclocked FX-8350 runs using the same driver as the 3770K (Catalyst 12.8), denoted as AMD FX-8350 and FX-8350 @ 4.9 GHz. Thanks for clarifying. Kind of a compliment to the fx chip for the untrained eye...12.11 3770k results should be there too, but perhaps it was too much testing to be done? I plan on doing that but will be lucky to get it done even this month. Wasn't worth holding the article that long. Honestly, if untrained eye actually reads the words that go with the graphs - especially the final thoughts - it would be difficult to come to that conclusion. Yeah of course...I bet most folks would read it, if they cared about it. If not, the standard fanboi might nitpick stuff and keep the tunnel vision anyhow. Major props, most trustworthy cpu/gpu reviews are found here in my opinion. Am I the only one that noticed that it says 'Intel Sandy Bridge' but it's an Ivy Bridge CPU in the first table? Thanks for pointing that out... it should be corrected now. What if you do a price/performance of the FX-8320? You can change the multiplier up to the FX-8350 frequency. 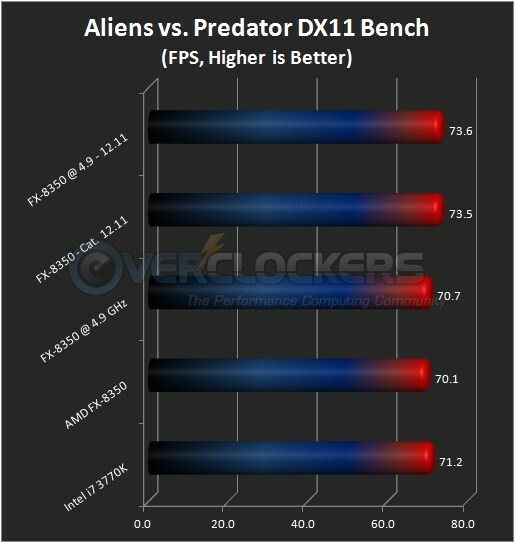 With the 8320 the AMD price advantage would be greater. The reason i ask if that here in NZ you can pick up an FX-8350 for around $290NZD, an FX-8320 for $250NZD and then Intel. $460NZ for a 3770k. The price difference is quite huge = to go Intel it costs 60% more! The 3570 non-k is about the same price as an FX-8350 but wheres the fun in a locked multiplier? Would be interested in that as a benchmark - I'll keep my eye out on the news! I always said "K" CPU. Its a $20 USD difference for non K to K CPU here so I imagine similar by you.. that said, the song remains the same in that the pricing is much closer with 3570K for gaming.